Barrhead Composite High School is proud of its continued academic successes and of the fact that it is recognized by parents and the public as a secondary school that implements an Inclusive environment. Over the years the students of our school have honored us by winning provincial, national and international recognition through music competitions, Skills Canada, Reach for the Top and various academic and athletic competitions. Barrhead Composite High School is an academic/vocational school that serves students grades seven to twelve. Prior to becoming a High School, students in the area attended one room schools known as Cottage schools. During the early years, student numbers grew so fast that the school district had to use the community hall and United church hall to accommodate different grade levels. It was reported that classes of 40 to 60 were not uncommon. In 1929, the Board of Education passed a motion to create an independent High School that would provide direct instruction to students in grades eight to twelve. In 1930, the independent High School began when Mr. Hugh MacLachlan became the first Principal. The High School was located in a four room building which was located along Highway #33, where the current Administrative Complex is now located. During this time it was difficult to find teachers who would teach all grades in one room schools in the country, so the Board of Education started a school bus run from Campsie to Barrhead to encourage teenagers to complete their education. This proved successful but because school buses were hard to acquire, grain trucks were converted into school buses. In an effort to encourage high school completion, the Board of Education of the day also establish a dormatory for High School students. For various reasons the dormitory idea did not work but this turned out to be the one room building that then served as the High School from 1930-1939. The fleet of school buses in front of the Barrhead schools in the early ’50’s. Some were converted trucks serving as school buses. Lorne Jenkins High School 1978 Point of interest – since 1941 the school colours have been Navy Blue and Gold. With large numbers of students coming to Barrhead to complete junior and senior high school the Board of Education and the town joined together to acquire a building. 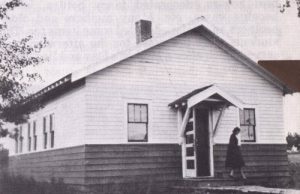 In 1949 the “Stehlin” Building was moved into an area where the Barrhead Elementary now stands. The E.C.Stehlin School was named after the School Superintendent that had served a long period of time. The building was an airplane hanger that was brought in from Penhold Airforce Base at the end of the war. In 1959 a school was built to house junior high students in the area. This building was named the following year to honor J. (John) R (Richard) Harris who was a pioneer teacher who had served students in the area for fifty years. Then in 1962 a major building project relocated the high school to its current location. A library, home economics and a woodworking area were added in 1970. The school was renamed in 1971 to honor Mr. Lorne Jenken who had been the longest serving principal in the area. Welding, mechanics, carpentry, cosmetology, health services, music and the cafeteria area were added in 1980. A larger gymnasium and office area were added to the East side of the school in 1988. This completed our conversion to a Composite High School; a school that promotes academic excellence and vocational skills. Finally in 1999, the junior and senior high schools that had independent administrative system were amalgamated under the Barrhead Composite High School Logo to enable continued excellence and innovative curriculum opportunities.